Toyota unveiled its FT-4X concept vehicle in New York with much fanfare. This four-wheel crossover SUV is aimed at younger buyers and offers a large variety of storage options, entertainment features and unique one-of-a-kind amenities geared towards buyers who enjoy the great outdoors. The Toyota FT-4x is built on the same platform as the Toyota CH-R and comes with a Multi-Hatch which can be opened vertically and horizontally. Available features include dome lights, USB compatibility and a built-in GoPro camera installed in the rearview camera ready to record outdoors adventures. The sliding rear floor offers a hidden storage compartment and a strapped sleeping bag strapped into the center console. The dashboard comes with built-in shelves and tubular heating vents that can dry wet clothes while the vehicle is in motion. A removable audio system ensures that you’ll always have tunes on the road. A smartphone docking station is built-in behind the steering wheel. 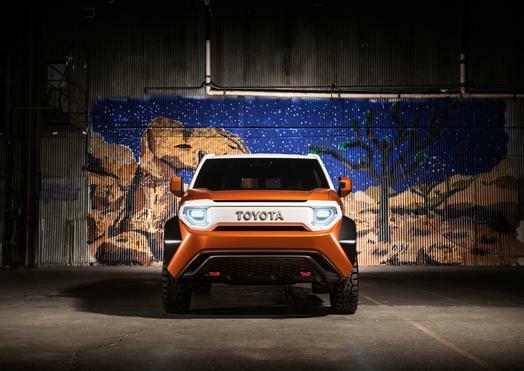 The concept vehicle is not equipped with a drivetrain but Toyota has stated it may be equipped with all-wheel-drive and a four-cylinder engine if it were to go into production. Toyota has not announced any plans for production.